Plate thirty from 'Picturesque Scenery in the Kingdom of Mysore' by James Hunter (d.1792). 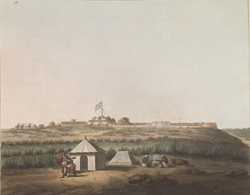 This aquatint is based on a picture by Hunter showing the old fort at Hosur, in Tamil Nadu. Hunter served as a Lieutenant in the Royal Artillery and his sketches portrayed aspects of military and everyday life. Here we see some sepoys camped in the foreground, and in the background, a large Union Jack flying above the walled town.